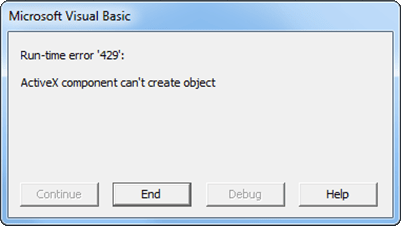 The Excel® software can display these error messages. You entered a formula incorrectly. Common errors include a space between the function name and the left parenthesis; or missing, extra, or mismatched parentheses. If you use the Spreadsheet Link™ software with a non-English (United States) Windows® desktop environment, certain syntactical elements might not work. For details, see Localization Information. Review the entry and correct typing errors. You executed a macro and the location of excllink.xla is incorrect or not specified. Click OK. The References window opens. Remove the check mark from MISSING: excllink.xla. Find excllink.xla in its correct location, select its check box in the References window, and click OK. Or, select Tools > References to open the References window. Select the box named SpreadsheetLink2007_2010. Click OK.
You used MLGetMatrix and the matrix is larger than the space available in the worksheet. This error destabilizes the Spreadsheet Link software session and changes worksheet calculation mode to manual. Click OK. Reset worksheet calculation mode to automatic, and save your worksheet as needed. Restart the Excel, Spreadsheet Link, and MATLAB® software sessions. You entered an invalid license pass code or did not install Spreadsheet Link properly. Ensure that you entered the license pass code properly. Reinstall the Spreadsheet Link add-on. (See Installation.) If you followed the installation guidelines, used a proper pass code, and you are still unable to start the Spreadsheet Link software, contact your MathWorks® representative. This message appears when an attempt to connect to the Excel software from the Database Toolbox™ software fails. Ensure that the Excel worksheet referenced by the data source exists, then retry the connection. This message appears when Excel 2013 is not configured properly. From the Windows Control Panel, remove Microsoft® Office 2010 in the programs list. This error appears when you start the automation server from the Excel interface, and multiple versions of the MATLAB software are installed on your desktop. Shut down all MATLAB and Excel instances. Open a command prompt, and using cd, change to the bin\win64 subfolder of the MATLAB installation folder. When the MATLAB session starts, close it. Using /regserver fixes the registry entries. Start an Excel session. The Spreadsheet Link add-in now loads properly. The value 3.14159 appears in cell A1.